The Eddie Becker Band is scheduled to play in the 3rd Annual “Git Rockin” Battle of the Bands to be held at The State Theatre in Falls Church, VA on Thursday, October 16th. Click the Calendar Menu Button for Time and Directions. “There is a War on the Middle Class” receives an Honorable Mention in the 15th Annual 2007 Billboard World Songwriting Contest. In order to qualify to receive an Honorable Mention, Eddie’s song placed in the top 1,500 entries across all 12 categories worldwide. “There is a War on the Middle Class” receives an Honorable Mention from the United Kingdom Songwriting Contest. This is the second consecutive year that the Eddie Becker Band has received an Honorable Mention from this worldwide competition. The Eddie Becker Band is selected to compete in the 3rd Annual “Git Rockin” Battle of the Bands to be held at The State Theatre in Falls Church, VA. This year’s competition was extremely tough with 46 band submissions and only 5 slots to fill. Each band was selected during a “blind” judging process comprised of 1,105 Government Information Group staff and event sponsors/supporters. Come out and support us on Thursday October 16th. Click the Calendar Button for Time and Directions. The Eddie Becker Band is pleased to announce that we have been selected by Rolling Thunder, Inc.’s Chapter 1 of California to perform for their 3rd Annual “Spirit of Freedom Ride” XXI. We will be appearing at the Main Pavilion Wednesday, May 21 at the KOA Campgrounds in Millersville, Maryland from 7:00 to 10:00 PM. Rolling Thunder, Chapter 1 rides annually across the United States from California to Washington,DC supporting all American Prisoners of War and Missing in Action (POW/MIA). You are invited to join us for an evening of music, camaraderie and saluting our troops who fight for our freedom. No cover charge or fees. The new Eddie Becker Band single, "There's a War on the Middle Class" recently released. “There’s a War on the Middle Class” is ranked # 7 on Artist Underground (formally American Idol Underground) on the R&B charts! War has been on the R&B charts in the Top 50 for over 13 weeks. Listeners on Artist Underground have rated this song among the top 50 tracks in the R&B genre during the previous week. See the current place on the charts by clicking here. There's a War on the Middle Class speaks to a topic reflecting events that are affecting every American today. Listen to the anthem composed by Eddie Becker, who encourages you to join the fight. July 2007 - Brian Priebe - Eddie Becker Band Trombonist Wins Second Place at the "International Alphorn Festival in Switzerland"
An American alphorn player wins second place in an alphorn contest at the International Alphorn Festival in Switzerland. 120 alphorn players came from around the world to take part in the 6th International Alphorn Festival which took place in the Swiss alpine ski resort Nendaz. Brian Priebe, an American professional Trombonist from Washington DC, was one of the 90 contestants to play for the 600 euro prize to be given to "Alphorn champions" of this year's festival. 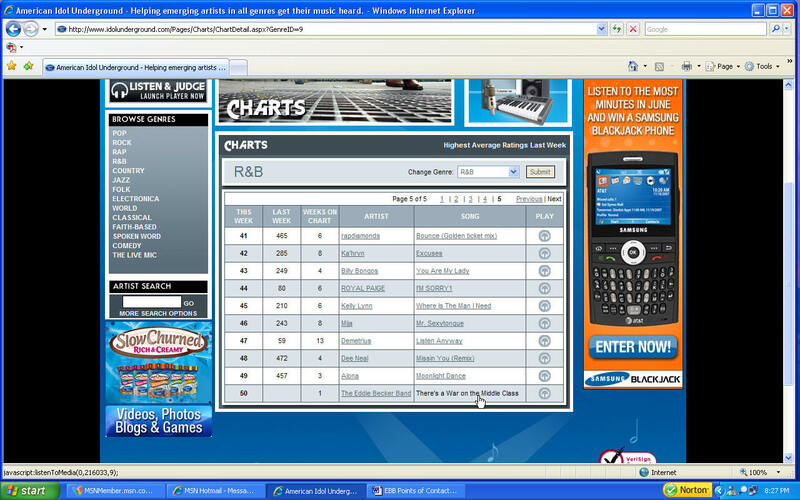 July 2007 - Blues Down in the Delta - Hits Number 1 on American Idol Underground! The online version of American Idol provides listeners the opportunity to listen and rate original recordings by bands throughout the world. July 2007 - There's a War on the Middle Class - Makes the top 50 on American Idol Underground! 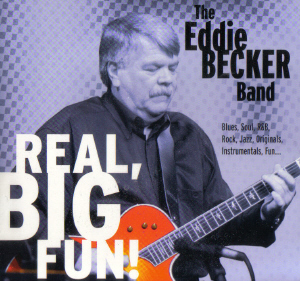 Eddie Becker and the Eddie Becker Band is nominated by members of WAMA for three awards for 2006 in the blues category. The Washington Area Music Awards, or ï¿½Wammiesï¿½, are considered by many musicians as the highest honor to receive in the local music scene. Eddie Becker wins the SAW Gold Award in the 2006 Jazz/Blues category for best song. SAW sponsors the Mid-Atlantic Song Contest (MASC) each year which is one of the longest-running contests in the nation which attracts entries from around the world. Awards are presented to the first and second place winners, gold and silver, in each category, with a panel of music industry professionals choosing three top prize winners from among those entries. The SAW Awards Gala took place on Sunday, December 3rd, 2006 at Jammin' Java in Vienna where Gold Award winners performed their compositions live. The Eddie Beck Band - Finalist in the Washington, DC Blues Society (DCBS), International Blues Competition (IBC). DCBS - IBC to be held on November 21, 2006 at Chic Hall's Surf Club, Bladensburg, MD. Winners of DCBS - IBC event will be sent to Memphis, Tennessee as ambassadors representing the Washington, DC Blues community. Blues Down in the Delta makes the TOP 20 ranking in the R&B category. Mountain Stage awards "Blues Down in the Delta" with an Honorable Mention in the Rock & Blues category. The Kennedy Center was a "buzz of excitement" on May 1st as 13 local songwriters and singers took to the stage to perform their original music before a sold out crowd of over 400 people. Stephen Schwartz (composer for Wicked, Godspell, Pippin), our celebrity guest host, was exceptionally gracious, introducing our presenters and sitting with them on stage as they performed. Eddie Becker is named a winner in the ASCAP Songwriter Showcase - original composition contest. The song Blues Down in the Delta, winner in the Light Pop category, is one of twelve winners out of approximately 500 entries. Blues Down in the Delta was inspired by the devastation and aftermath of Hurricane Katrina. The ASCAP awarded, Blues Down in the Delta, was recorded by the Eddie Becker Band who was also named a finalists in the 2005 DC Blues Society blues performance competition. As winners of the ASCAP Songwriters Showcase members of the Eddie Becker Band will perform an acoustic version of Blues Down in the Delta at the Kennedy Center in Washington, DC on May 1, 2006. The special guest host of the ASCAP Songwriters Showcase will be Stephen Schwartz, the highly acclaimed composer and lyricist for such successful Broadway shows as Godspell, Pippin, and his newest smash hit, Wicked. This ASCAP event will present talented songwriters from the Mid-Atlantic region - including DC, Maryland, Virginia, Pennsylvania, and Delaware. Each songwriter (or their designated singer) will perform a song representing one of the following genres - musical theatre, jazz vocals, cabaret, or light pop. The Eddie Becker Band is cooperative of musicians, most who play in other bands throughout the Mid-Atlantic region. Eddie being a native of the Washington DC metropolitan area has had the opportunity to play with some of the metro areas finest musicians. As a result the Eddie Becker Band line-up will change depending on the venue and type of event. The core band is a standard - guitar, bass, drums and lead vocalist. Frequently the band will also include a harmonica, a saxophone or feature a four piece horn section - appropriately named the Beltway Horns. The bands set list cuts across genres that include - classic 60's soul music, swing, blues, rock-a-billy and roots rock. This range of material is possible because Eddie's guitar style incorporates many diverse influences.